In August of 2016, Rachel Hepworth embarked on a unique challenge: start a growth marketing team at one of the most successful startups of this generation – one that had long relied heavily on word of mouth. That company, of course, is Slack, and Rachel’s growth marketing team now owns Slack’s full acquisition funnel, from demand generation and team creation to activation and monetization. I recently hosted Rachel on our podcast to learn why Slack needed to invest in growth marketing, what her team prioritized first, how they’ve partnered with Slack’s rapidly scaling sales team, and more. This is the second in a series of interviews over the next couple months about unlocking the potential of growth. If you enjoy the conversation and don’t want to miss the rest of the series, check out more episodes of our podcast. You can subscribe to it on iTunes or grab the RSS feed in your player of choice. Adam: Rachel, you’re leading growth marketing at one of the fastest growing software companies of this generation. How did you get yourself into that position? Rachel: A lot of luck and serendipity. The role that started me on this path was joining a very small startup a little over a decade ago, Climate Corp. It sold weather derivatives to businesses of any size to basically protect them from the weather. Imagine retail companies, agricultural companies, event companies. If it rains, if it snows, if it’s too hot, their revenue will dip, and there had previously never been a way for people to protect against that downside. You could only exchange multimillion dollar derivatives on some kind of energy platform. I joined as their demand gen marketer and spent a year throwing things at the wall trying to build interest and pipeline for the sales team, and failing 100% at every single thing that I did. It was what I later learned was the classic startup experience of really smart founders and founding team have an idea that’s really clever, don’t validate it at all in the market, build a product, build out a team, realize they don’t have product-market fit, and just freak out and don’t know what to do. I hadn’t heard of any of these concepts before I joined, so I was basically discovering from scratch. Nobody wants to repeat what they’ve been doing and not succeeding at again and again, so I started reading a lot. I stumbled upon Eric Ries and Steve Blank, the concept of customer development – it was a revelation. These people were describing exactly what I had been through. I pivoted my own function from trying to generate demand for a product that clearly wasn’t quite right to let’s figure out what the right product is. Eventually we focused on agriculture, on corn and soybean farmers, and changed from a concept of a thousand tiny contracts sold a day to a couple giant contracts sold a month. After I had left, we started to see that we had product-market fit. We got sales leads. We were closing deals. Climate Corp ended up being acquired by Monsanto for a little bit more than a billion dollars. It was really interesting experience: you have an idea, you think it’s great, and you do the exact wrong thing of building out the machine before understanding it. I took a quick break to go to business school, and then from there, I joined LinkedIn, initially to grow their subscriptions product, and then moved around to various different functions like consumer marketing for the home page. Eventually I was doing lifecycle marketing and running the marketing for all the content products like the feed of LinkedIn, the influencer posts, and things like that. In a sign of how small the tech world is, Slack’s VP of Product, April Underwood, worked very briefly with me at the tiny Climate Corp startup many, many years ago. I connected with her, learned about what Slack needed, and ended up joining as their Head of Growth Marketing, and really built out the team over the past year and expanded funnel stage by funnel stage. I started off really focusing on making sure that all of the teams that Slack had acquired were healthy, active, and might eventually pay us. We’ve now expanded up and down the funnel to now be part of performance marketing and demand generation, all the way through to driving those teams to actually upgrade us through the self-service funnel. Adam: Historically Slack has relied heavily on virality for its growth. There’s been occasionally advertising here and there, but what made that point when you joined in 2016 the right time to invest in growth marketing? Because until then, at least publicly, it hadn’t really been talked about as something that Slack was going to actively pursue. Rachel: In 2014 and 2015, Slack had this incredibly growth, but it was growth off a small base, based off very early adopters. For Slack, that was clearly the engineering and dev communities, who love new tools. They love new ways of working and were happy to bring Slack into their functional teams and say, “Let’s experiment with this new way of working.” It was very successful. As Slack expands into a larger enterprise product, you have to start appealing to groups of people and types of roles and industries that aren’t in that really early adopter group. Things like media companies, finance companies, retail companies, sales functions, marketing functions and customer support. 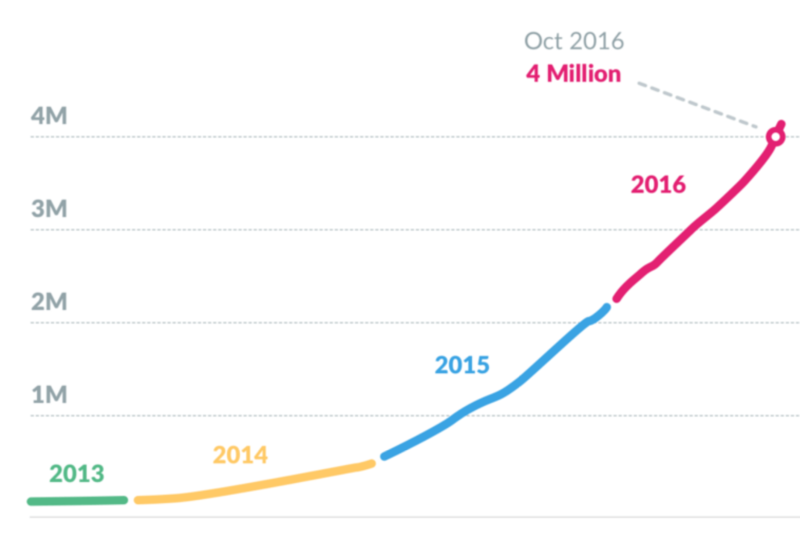 Slack’s incredible growth was primarily driven by word of mouth until late in 2016. How do you attract these different types of people and build the value for Slack going wall to wall inside of a large company, versus a startup of 10 people or being siloed in the engineering department of a larger company? That involves a lot more education, outreach and nurturing for people whose DNA is not to try new things and scrappily figure out the best way to make it work. Similar to Climate Corp, we have to figure out how to tell them what the value is and serve them up the solution, rather than saying, “Slack is here. All you have to do is enter your email to get started. We’re pretty sure you’ll be successful from there,” which is the way we’d been operating in the past. Adam: I imagine there was a lot of low-hanging fruit sitting there for you when you walked in the door, which means prioritizing must have been quite a challenge. Where did you start? What was your mindset? Rachel: We knew we were going to start with performance marketing, and that’s partly because it’s something the team had dipped their toes in, it had shown signs of success, and it’s something that our CEO Stewart Butterfield is particularly interested in because of its scalability. Slack has obviously raised a lot of money, so we weren’t hampered by budgets as long as the ROI was there. What’s key about Slack’s performance marketing team is it’s very sophisticated compared to most. We use a multi-touch attribution system. There’s no first click, last click. We track everything, and we give credit for impressions, clicks, actual conversions, etc. We spent a lot of time and effort setting up that foundational system and making sure that our data was really good. A lot of folks outsource performance marketing to agencies, or use a simpler attribution system, which is fine and correct if your budget is smaller. For the amount of money Slack is spending, we needed to bring it in house. That was really heavy lifting, but the performance marketing team is now driving a fairly hefty chunk of team creation, so it’s been very successful. It’s what we spent most of 2017 building out. In 2018, we’re going to focus on the more typical demand gen functions. We have a lot of people going to slack.com, where it’s very simple to start a team. But for those who aren’t inclined to jump into those waters and try to convince their coworkers that there’s a new way to work, we need to do a little bit more in terms of holding their hand, showing them the value and giving them more information. Not just saying, “There’s a home page with an email enter field. Click here to get started,” which is what we’ve been relying on up until now. Adam: What were some of the aha moments that you experienced in those early days, when you’re trying to find product/channel fit? Rachel: When you have a product that is so strong on the organic and word of mouth side of things, driving additional demand through marketing programs is actually quite hard, because you’re trying to build off of a fairly strong base. Slack has this incredible organic word of mouth, but how do we supercharge that and make it easier for people to talk about Slack, and incentivize them to start Slack teams? The product can do a huge amount there. One example is Slack recently released a new product feature called shared channels, where you can actually work with another company, an external organization, inside of your own Slack instance. Each Slack team is sharing a channel and you don’t have to go and switch to email when you’re working with people outside of your company. If you have a brand or advertising campaign and you’re working with an external agency, you just bring them right into a shared Slack channel. That has potentially huge virality effects, and builds a moat around Slack. That’s where the product and then growth marketing teams will meet. The product enables you to share a channel, but how do we make sure that people know about it? How do we create really great invite and email flows? When that other company gets an invite to a shared channel, how do they understand what it means? If they are not already a Slack user, how do we enable them to start a Slack team and then accept that shared channel request? It’s a lot about building those flows. Adam: You mentioned the team started with performance marketing. Walk me through how you built it out from there. Was that more of a proactive approach, or as you were scaling your operations did things start to bend and you had to respond to that? Rachel: We knew we wanted to build out the team, because we’d already done enough in 2016, mostly before I joined, to know that there was value there. I’ll be completely honest, I am not an expert in performance marketing. That is a function where people go really deep, and they have a lot of very, very specific knowledge, particularly when you’re spending a lot of money. So the first thing I did was hire somebody who knew a lot more about performance marketing than I did, and I was honest about the fact that I’m really good at asking questions to learn and test assumptions, but that doesn’t mean I can talk about the intricate details of setting up a really great search or display campaign. The great thing about performance marketing is the ROI is really obvious, so you can justify increased spend and increased headcount based on the performance, and that’s what we’ve done. We had this team of three with really hefty budgets and really hefty goals, and they’ve been successful enough that now that team is expanding and taking on new responsibilities based on the success that they’ve had. One of my great philosophies with growth, because it spans so many areas, is I really only know enough to be dangerous in many of these areas, and the biggest thing I can do for Slack is hire people who know a lot more than I do and give them free rein to do their best work. Adam: Be it around prioritization or measurement, are there any particular values or principles that you’ve rallied behind as you’ve scaled the team? Rachel: One of the things I’m really concerned about is that we’re not here to acquire just free teams. We’re here to acquire teams that have the potential of paying Slack at some point. Last year we pivoted from asking, “How many teams are we creating?” to “How many work teams are we creating?” Even though an enormous amount of our team creation is social, based on how much people love Slack, work teams are the teams that pay Slack. Looking at the full funnel of metrics and not just stopping at that team creation number is really important for knowing if we are driving value for the company. The friction is so low to starting a Slack team that you could really drive a lot of really poor quality teams if you didn’t pay attention to it. Secondly, I’m always asking the team how we can put in less effort for better results or more learnings. At a place like Slack, the quality bar is really high and the temptation is to go all in on everything, which I appreciate and think is important. In the worst case, however, it’s high effort and low impact. You can’t be perfect every time; you’re going to have some duds. So how can we be really clever and scrappy about doing a very small initial test when we’re trying a new channel or a new strategy, and get some of that quick early feedback to see if this worth investing in more? Then we’ll scale up from there, rather than throwing in enormous resources to make the most beautiful thing that never moved a single number. It’s difficult, and designing really smart MVP tests is quite hard. The temptation is to scale it back too much. Then, it’s not successful, because you didn’t invest enough. It was such a scrappy, bare bones experience that it was a poor test and it was never going to work. It was doomed to failure. You really have to strike the right balance. Adam: You mentioned Slack’s history with sales earlier, and how that may be changing as you go after more enterprise customers that are going to need a earlier touch point with a real person. Slack, historically, had not had salespeople or a very small, minimal team. In the past year, however, the sales team had grown rapidly. Growth marketers typically work very closely with sales teams, so how has that impacted your team’s work? Rachel: The relationship at Slack is quite different than most enterprise companies. We don’t have your classic MQL program, where demand gen would do all of this nurturing and score the leads in Salesforce, and the sales team would pick it up from there. Our goal is to get those healthy work teams created, because the sales team prospects from the existing Slack user database. That’s an incredible benefit. Would you rather go after somebody who’s actively using the product and you know is getting value, or somebody who downloaded a white paper and may be vaguely interested? We need to take advantage of that freemium funnel where there’s no barrier to getting in the door, and use that to help the sales team be really efficient. Slack has scaled so much faster than the actual infrastructure that it’s a little bit of like running after the growth. Right now we’re working on an account or company scoring model where we take those teams that are active in Slack and help the sales team understand which ones they should prioritize. There are so many active work teams, and for sales it’s a great position to be in, but that also means you can be really inefficient with your time. The scoring model we’re implementing right now will account for the activity level of the team. How much value is this team getting out of Slack? Do they have a lot of people on it? Are they very active every day? Are they using integrations? We combine that with firmographic data of company size and industry, and we use that to prioritize the thousands and thousands of teams that sales could go after. Instead of an MQL model, it’s a little bit closer to what people are now calling a PQL model, product qualified leads. There’s a separate team that does sales support and enablement. We work from the same playbook in terms of insights about the customers and the value story that we want to tell, but my team is not responsible for sales enablement. It stops at the point of either an upgrade through the self-service funnel, or being triggered as a viable lead for sales, after which we step away. Adam: Has all of this felt like a major change in mindset or workflow? Rachel: It hasn’t been a major change yet, but I anticipate it being a change. One of the biggest tracks of work has been building the infrastructure and tools – bringing on a lead scoring tool, bringing on the marketing automation tools, hooking up our product data to marketing data so that we’re even smarter about the marketing messages that we employ. Again, Slack grew faster than its infrastructure, so this is all quite painful, but also really foundational and worth the very heavy lifting that it has to go through. We’re going to build that marketing to sales model this year. It’s really in its infancy stage, so it’ll be interesting to see how it evolves. Adam: Is there anything that, in hindsight, you wish that your team had been more proactive in doing to help with this change, or is it simply a situation where you have to respond and adapt in real time? Rachel: We’ve been fairly proactive, but nothing is ever as fast as you wish it were. Even if it’s fast, you wish it went faster. One thing, not so much on the sales relationship side, but just growth marketing in general, where I wish we’d been able to iterate faster is website testing. We have so, so many visitors to the website, and we have not yet enabled the systems to allow for really rapid testing. We have a very robust engineering team, design team and writers, and that’s a wonderful place to be, but we haven’t enabled the tools that, for instance, would let a marketer quickly test a landing page in a day. It doesn’t exist yet. That’s something that we have to bring on now. Given the amount of visitors to slack.com, that’s where some of the biggest wins will come from. Adam: Slack’s brand is so strong and well defined. As someone whose team is creating one of the very first touch points for that brand, is that an advantage of your team, or does it create a checkpoint that slows down the process of testing and iterating quickly? Rachel: There’s a reasonable balance. I strongly believe that a brand lifts a company hugely over time, and it’s hard to build a brand. It’s quick to destroy a brand. A lot of the growth tactics and initiatives we might employ, you might have an initial positive result, but if you’re dinging the brand, over time you will really hurt yourself because it’s going to impact growth. One example I always go back to is from my days at LinkedIn. People are fairly familiar with LinkedIn’s incredible email machine, and there are a lot of jokes made about it, but it’s very performant and it drives a lot of business. The challenge is that every individual email that LinkedIn sent out or spun up would have positive metrics in that email silo, but then when you take a step back, you can look at some of LinkedIn’s most active members and say, “That person got 300 emails last month.” Nobody thinks that’s a good thing or experience, and the CTR on all the emails have decreased dramatically over time. Incrementally it all looked good, but when you stand back holistically, first of all as a rational human being and secondly looking at the metrics of the email program in general, you could see how much damage has been done. That is a real learning point that I hold dear. Individual tactics can look good in isolation, but you really have to look at the holistic impact on the customer and use some common sense. If something feels spammy and low value and bad, it probably is, and you don’t necessarily need a test to tell you that. Adam: We’re speaking January 2018. Looking forward, where do the biggest growth opportunities lie for Slack, and how are you looking to get there? Rachel: We’re focusing a lot on the website. Slack’s website is fairly simple right now, because we’ve been 100% focused on getting people to enter their email and create a team. Now, as we expand out to new audiences, we know we need to nurture and educate different types of people more, and we have to build out a lot more content and educational info on the website, along with some of those customer journeys. There are also some things that we’re really interested in experimenting with. We have this really robust set of integrations and partners. How can we work with partners to drive growth? How can we supercharge our own member base that already is so powerful and use them as a way to spread the word about Slack a little bit more? The third thing is ramping up the efficiency between all of the free creative work teams we acquire and getting them to upgrade or passing them off to sales in a much, much, much more efficient and seamless manner. It’s still a lot of foundational areas that we’re going to be focused on, but we’ve got our goals established for the year, so we’ve got to start running towards them. Adam: To close out,I’ve got a few rapid-fire questions for you that we’re asking all the growth guests in this latest conversation series. First up, favorite growth tactic that you think is underused? Rachel: This is not typically thought of as a growth tactic, and it goes back to my product marketing and Climate Corp days – that’s research and customer insights. This is overlooked so often: you can do messaging that’s okay, or you can really know who you’re targeting, nail their pain points and reduce the time of them saying, “What is this?” to “I need this.” It’s something I think people don’t rely on enough. Growth teams are often siloed as the testing center, but if they’re not really deeply grounded in the customer, you’re missing out on a lot of opportunity. This isn’t going on one customer call, this is really knowing who they are. Adam: What’s one book that has influenced your thinking, and why? Rachel: I really love Made to Stick. It’s one of the only business-oriented books I read more than once. This concept of people remember and are compelled by stories and not by facts and figures, it’s so true but so easy to forget. Particularly as a rather quantitative marketer, I forget it all the time. Adam: As someone who’s trying to show others how to get value out of a product, I’m sure you’re evaluating onboarding experiences in your personal life. Anything that sticks out recently? Rachel: I love the onboarding for Headspace, which is this meditation app. I’m trying to be more zen, so I’ve experimented with it. Meditation is this very opaque concept to a lot of people, and they do a really good job of walking you through it initially. 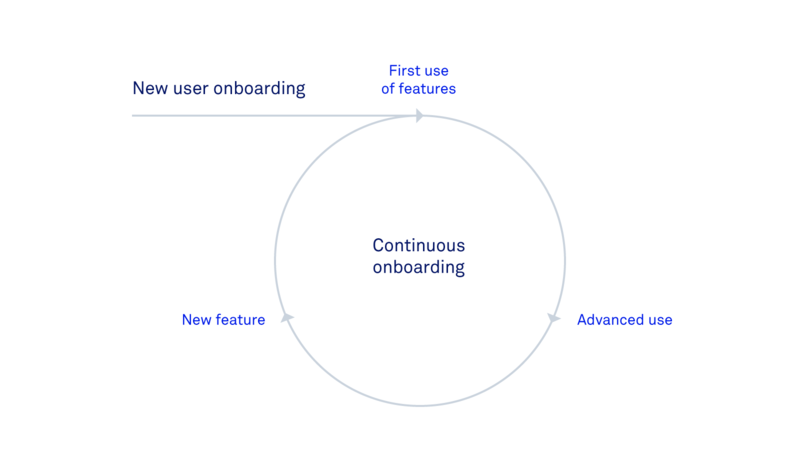 What I really love is that they have what I call continuous onboarding. It’s not like it’s the first five seconds and now we’re never going to help you again. In opportune moments they trigger some piece of educational content that makes sense for you in that moment. They do a really nice job. Adam: Messengers, are they a game-changing new channel for growth? Rachel: I can’t not say they’re not game changing, given where I work. But even separate from Slack, when you think about WhatsApp and WeChat and Facebook Messenger, it’s pretty obvious this is a major new platform that people are experimenting with. This is where people are more and more spending all of their time, and whenever there’s a new channel that people spend a lot of time in, that’s going to be a pretty impactful channel going forward. Adam: What’s a common mistake that you see other growth marketing teams making when it comes to running experiments? What really gets under your skin? Rachel: Not knowing what you’re going to learn from the experiment. It’s not just let’s put out this email or this piece of content or put this CTA here. It’s asking, if it’s successful, what does this mean, and if it fails, what does this mean? You should be able to learn something either way. Most of your experiments will fail. Especially at a startup when there’s so much you don’t know, most things are just experiments where you should have an actual hypothesis going into it and not just throw random things at the wall. I made this mistake at Climate Corp. I didn’t have any hypotheses, I just tried everything and then moved on to the next when it didn’t work. So I’ve been there and I’ve made that mistake, but the only true failure in an experiment is if you don’t learn anything from it. You really have to do that from work of deciding what your theory is going in, up front. Adam: That’s some great closing advice. Rachel, thanks so much for joining us.